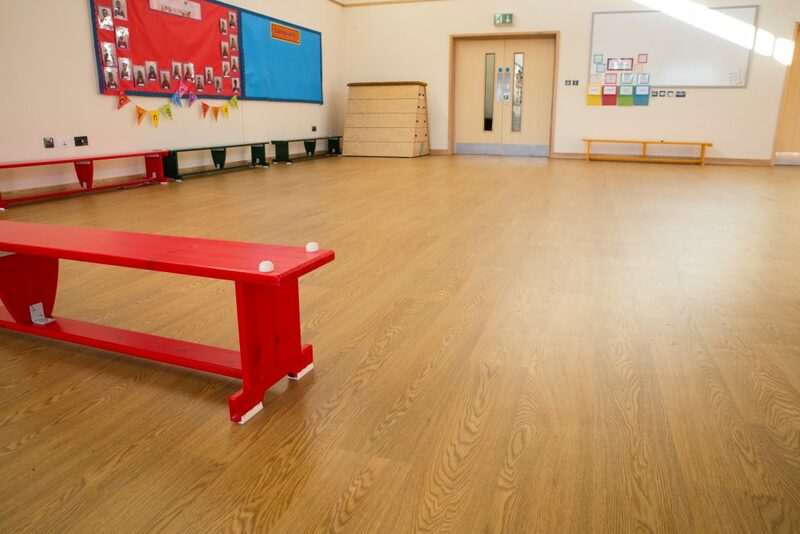 High performance commercial vinyl flooring from UK manufacturer Polyflor was recently installed at Llwyncrwn Primary School in Beddau, Wales to create a brand new junior block at the school building. Cardiff based flooring contractors CS Flooring Solutions fitted around 600m² of Polyflor vinyl flooring throughout the new school building as part of Rhondda Cynon Taf Council’s £4 million refurbishment project. Led by main contractors Morgan Sindall, the new extension is a sustainable seven classroom building attached to the recently built infant school. Wood effect vinyl flooring from Polyflor’s Forest fx PUR range in the Classic Oak design was installed in the school hall and meeting rooms, whilst high design Polysafe Verona PUR safety flooring in the light blue Skyline shade was selected for the classrooms, cloakroom, kitchen, and toilets. 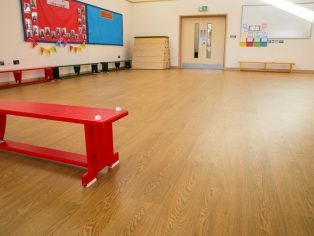 A proven performer in demanding education environments, the Forest fx collection of sheet vinyl flooring features 14 realistic wood effect designs which include a cross-linked and UV cured polyurethane reinforcement (PUR), offering a low cost, polish-free maintenance regime for the lifetime of the flooring. The Polysafe Verona PUR range features virtually invisible slip resistant particles and complementary tonal chips, offering the high clarity look of a smooth vinyl floor but with the performance of a safety floor. Delivering sustainable wet slip resistance throughout its guaranteed life, the high performance Polysafe Verona range fully adheres to the European Standard for safety flooring EN 13845 and meets all HSE and UK Slip Group Guidelines for slip resistance. Verona achieves 36+ on the Pendulum wet test, has a surface roughness of 20 microns and above and meets the 50,000 cycles abrasion test of the EN13845 standard, ensuring the virtually invisible particles incorporated into the product are sustainable and will provide continued friction over the long term. Polyflor’s vinyl flooring used on this project contains recycled material and is 100 per cent recyclable via the Recofloor vinyl take back scheme. The sustainability credentials of Polyflor’s flooring are supported with the award of BES 6001 for responsible sourcing and certificated BRE Global A+ ratings for the Forest fx and Polysafe Verona ranges in education settings amongst others, which helped contribute to the BREEAM credits earned during the Llwyncrwn Primary School development. This resulted in an overall Excellent rating for the project. Polyflor flooring samples can be ordered free of charge on the Polyflor website or by calling the Polyflor Samples Direct Hotline on 0161 767 2551.